With the help of their mentor Felix (Tim Curry), a group of best friends and first-time thieves -- Julian (Balthazar Getty, Audrey (Olivia Williams), Holly (Stacy Edwards) and Kevin (Daniel London) -- steal a valuable statuette for a ruthless black market art dealer. After the amateurs botch the delivery of the objet d'art, the art dealer kills Felix and forces the remaining four to ''find'' $1 million within a week's time of face certain death. Now desperate, the friends concoct a plan whereby each of them takes out a $1 million life insurance policy on themselves. Consequently, if one of the friends dies, the others will collect on the policy and pay off the dangerous art dealer. 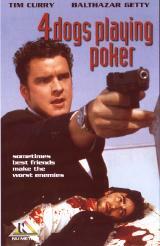 Once the closest of friends, the down-and-out group must enter into a secret but lethal lottery to choose which one will be the victim and which will be the killer.